An atmospheric modelling specialist from the United States brings exciting new capability to forest protection research at Scion. Dr Tara Strand has unique skills and experience that are valuable across many research projects aimed at supporting the forest industry. Such projects include fire behaviour modelling and smoke dispersion; pheromone dispersion; disease spread; and pesticide deposition and drift for pest control programmes. When Tara accepted a job at Scion, little did she suspect that her first project would involve kiwifruit. Zespri is drawing on Scion’s expertise in aerial spraying to support their ongoing battle with Psa (Pseudomonas syringae pv. actinidiae). 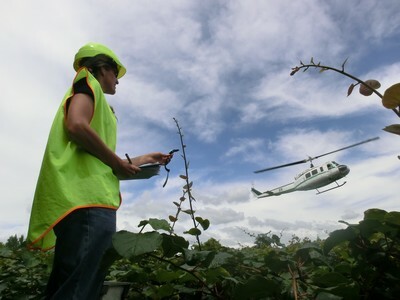 Tara’s expertise in turbulent air movement combined with Scion’s experience with aerial spray application is being applied in a series of spray trials for Zespri. Their aim is to optimise treatment methods for Psa in orchards. The research involves using sonic anemometers, which are advanced instruments for recording wind movement in three dimensions. These instruments have recently been purchased by Scion and Lincoln Ventures Ltd for use in the collaborative research programme, “Protecting New Zealand’s Environment from Pesticide Exposure”, funded through the Ministry of Science and Innovation. Tara’s skills in turbulence and atmospheric science have been applied in a range of projects in the United States relating to air quality and carbon emissions. Her most recent work involved fire behaviour and smoke dispersion modelling for the US Forest Service.